The 2017 Pennsylvania Saddlebred Horse Association held it’s Annual Year End High Point Awards Banquet on Sunday, January 28th, 2017 at C.J. 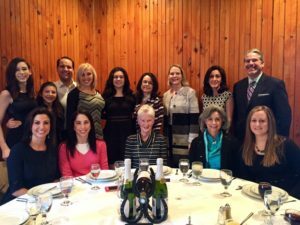 Hummels Restaurant in Lenhartsville, PA. Over 150 people came to celebrate the memberships’ 2016 achievements and announce last season’s High Point winners. The Scottfield Team took home both the 3 Gaited and reserve 5 Gaited High Point Championships with Junior exhibitors Renna Russo and Sarah Hecht respectively. Sarah also took the Hackney High Point Championship with her pony, Aragorn. Jen Makem topped the Country Pleasure division with Jenna Billger’s mare, Miss Lady, earning the reserve. Ann and Mary Lehan’s fabulous spotted hunter, Hope Remains, took the Country Hunter Pleasure High Point Championship capping off a great season for the good team. The Pennsylvania Saddlebred Horse Association is a fantastic group of hard-working fun loving horse people, and these awards are beautiful!! CLICK HERE to download a membership form for this season so you too can be included in this super program! We would like to congratulate the Hecht Family on the sale of their grand Park Saddle gelding, Ultra’s Special Delivery! Del will move to Akron, New York, to be in training at Champion Hill Farm where his new owner rides. “Del” joined the Hecht Family in 2014 and was the first Morgan purchased by the Hecht’s. Teamed with then 11-year-old Sarah Hecht, this spec ial team would go on to have an undefeated 2014 season, culminating with Sarah and Del winning the Grand National title in the 15 & Under Park Saddle class at the Morgan Grand National and World Championship Horse Show. 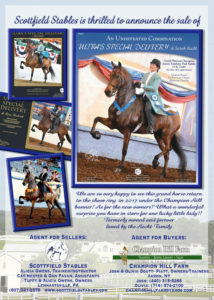 Prior to Sarah owning and showing this grand gelding, Del was owned by the Quigg Family of Montrose, Pennsylvania. With Haleigh Quigg in the irons, Del was Reserve World Champion in 2008 in the Walk and Trot English Pleasure World Championship. Given his 11 year history with Scottfield, Del is more of a family member than a horse on the show string, and finding the perfect next show home for him became imperative to all who have known and loved this once-in-a-lifetime Morgan. Because he is so dear to us, it is with much enthusiasm that we announce that we have found Del the perfect place to continue his show career! Under the watchful eye of new trainers Olivia Doutt-Piatt and Josh Piatt at Champion Hill Farm, Ultra’s Special Delivery will resume his winning ways this show season, returning to the walk and trot division with a soon to be very surprised young lady! (We will release her name once the little lucky lady is handed the gift of Del’s reins!). We are confident that Del will carry you all to countless more blue ribbons! We will be cheering for you!! 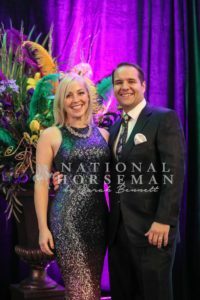 David “Tuffy” Owens and wife Alicia at the 2017 UPHA National Convention held in New Orleans. 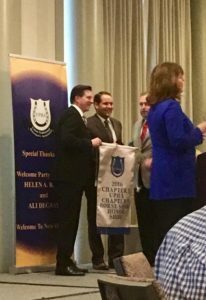 For the second year in a row, AMP Horse Show Services and show manager David “Tuffy” Owens were presented with two UPHA Chapter Honor Show banners, as chosen by the members of Chapter ¾ and Chapter 5. The UPHA Chapter 5 Honor Show of the Year was the UPHA Chapter 5 Horse Show in Kansas City, Missouri. Chaired by Robert Stezovsky, the 2016 event was once again a huge success. Now the honor show for this chapter for four consecutive years, the UPHA Chapter 5 Horse Show will try for five years in a row, May 10-13, 2017. Lisa Waller will be the judge this year, with Missy Hughes Smith as the new chapter chair and show chair. With the Madison Classic Horse Show back on the schedule in 2016 after a two-year hiatus, its return to the calendar was received with great excitement. The UPHA Chapter ¾ Honor Show for 2016, Madison is chaired by the tireless Lynda Freseth. Lynda and Tuffy teamed up in 2015 for a chapter honor show title for the Wisconsin Futurity Horse Festival. With a ton of momentum headinginto 2017, the show dates will be May 25-28, with Melissa Moore as the judge. Scott Matton is the chapter chair this year, while Lynda Freseth will remain at the helm as show chair. In the four years of its existence, AMP Horse Show Services has never been beaten out for a chapter honor show banner at the UPHA National Convention!